From flowing kaftans to the perfect one-piece swimsuit, we’ve put together a list of some of the warm-weather styles we’re in love with, and will be sporting poolside, this Summer season. Pair this lighter-than-air beach skirt with a white tee or black tank top. A cotton voile top that can take you from day to night, we cannot wait to get this blouse! This London designer, previously a stylist for British Vogue, makes kaftans with handmade textiles that take you easily from beach to lunch. 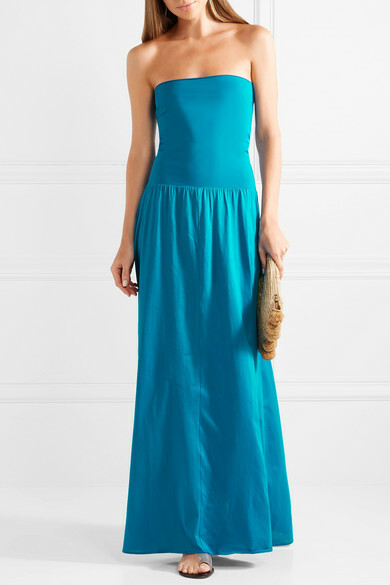 This solid-colored Eres dress is the perfect style to slip over a bikini or wear to dinner with sandals. The sculpting bodice offers a smooth and flattering fit, while the cotton-jersey maxi skirt moves beautifully with every step. Complement the pretty turquoise hue with gold or white accessories. Figue designer Stephanie Von Watzdorf's dresses, caftans and accessories are beautifully embellished with beads, fringe, original prints and layered textures. Figue offers many different clothing styles for every body shape, as well as gorgeous accessories that are equal parts luxurious and bohemian, like these darling pom-pom sandals. With high-quality fabrics and fun styles in both bikini and one-pieces, Karla Colleto makes the best bathing suit. Their styles come in many different colors and we love this particular piece, with one-shoulder design and eye-catching ric-rac detailing. Made from breathable textured cotton, the Claire skirt adds the slightest touch of drama to any summer outfit. Finished with inset lace trims, the four tiers of ruffles create a soft sweeping motion, perfect for summer afternoons by the pool. This flowy off-the-shoulder midi dress by All Things Mochi is summer ease epitomized. Imbued with the brand's signature global eclectic-ness, the Barta dress is the perfect way to make a statement, without any effort whatsoever.